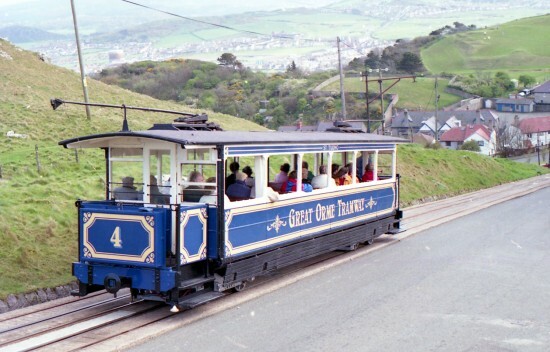 We are heading back 25 years in today’s archive image with Llandudno’s Great Orme Tramway the subject. In this photo we see no. 4 descending the lower section of the tramway on 17th April 1993. Much in this image is as you will see if you visit the tramway today with the tram in same lined out blue and gold livery, carrying the St Tudno name and the trolleys are still on the tram although no longer used for any purpose. The trolleys had previously been used for communication purposes only but by 1993 the overhead had been removed with the poles used to hold this wire still in place as seen just above the front of the tram.